Users in Google Chrome are great. I wish every browser had a similar feature. If you have multiple browser windows open at once running different users (one for work email, one for personal, for example) a downside is that whichever browser window you close last will be the User that is used when you open Chrome again. 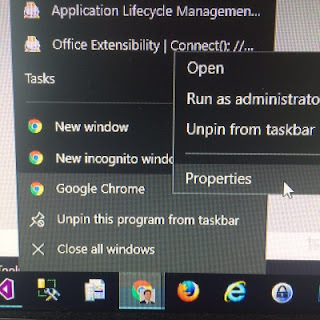 However, by modifying the taskbar shortcut you can override this functionality and always have your "Default" user be used. Right click on the Google Chrome taskbar icon, then right click on the "Google Chrome" entry in the popup menu. In the Google Chrome Properties shortcut settings window that appears, append ` --profile-directory="Default"` to the end of the Target value.